We have extensive experience implementing solutions for a variety of Clients within a range of environments including Healthcare, Semi Conductor, Injection Moulding, Pharmaceutical, Medical Device and Opthalmics. We also are specialists in the design and construction of containment suites up to ACDP level 4. Our proven methods ensure quality and service are inherent in every aspect of our projects. We offer a range of solutions dependent upon our Clients requirement’s, this flexibility ensures we can offer a cost effective option, no matter what size of facility is required. Each new cleanroom design undertaken by Enbloc benefits from the many years combined experience of our in-house team of degree qualified designers. Enbloc are able to carry out the design of every aspect of a new facility including all architectural, mechanical and electrical components. As part of our turnkey solution we can develop a design from a User Requirement Specification (URS) or work alongside the Client from concept stage. The vital element of any cleanroom design is the ventilation system. This provides cleanliness, containment and environmental control for personnel and product. 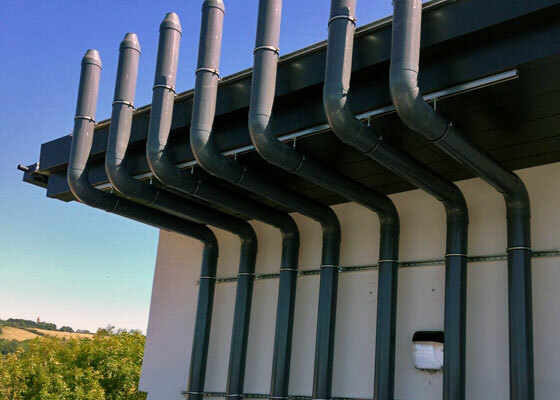 Enbloc designers assess and select HVAC systems and utilities to suit each Client’s specific requirement, using innovative and energy efficient solutions. 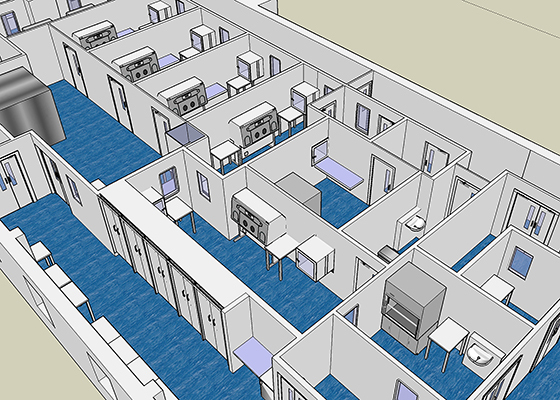 Enbloc’s designers are experienced in a varied range of challenging rooms including ACDP level 4 containment rooms, climatic chambers, class 1 cleanrooms and zone 1 requirements. These systems are ideal for generic fast track cleanrooms. Most of the modular systems offer flexibility for future alteration as they are demountable. Enbloc are not tied to one particular wall or ceiling system. We can select from a vast array of systems depending on the Client’s classification and budget. 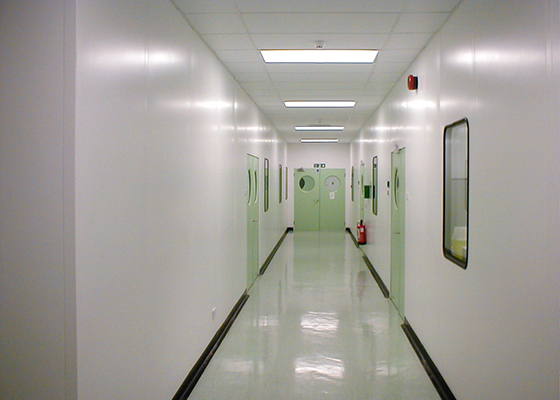 We can offer extremely economical cleanrooms constructed from these systems. For specialist situations including certain high classification rooms or containment suites Enbloc offer bespoke construction solutions. 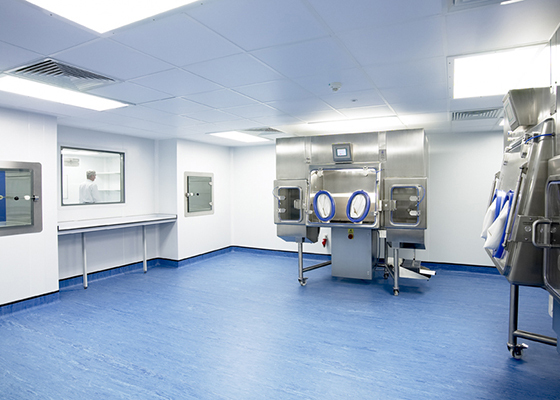 We have experience in vinyl flooring and wall systems to create a seamless cleanroom cell. An alternative seamless system we offer is Glass Reinforced Plastic (GRP), ideal for negative pressure containment rooms. Mobile cleanrooms offer smart, modern accommodation ideally suited to situations of limited space or short term requirement. The internal design and fit-out can be tailored specifically to meet your exact needs; either pre-installed, therefore complete on delivery, or constructed on site. Furthermore, we can extend our flexible approach by offering a hire purchase alternative, if appropriate, to the standard outright purchase. 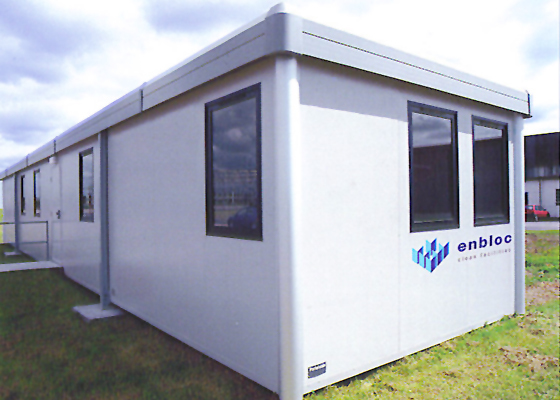 Portable solutions are currently in place throughout U.K..
Enbloc have a proven track record in the design and installation of containment laboratories up to and including Containment Level 4. 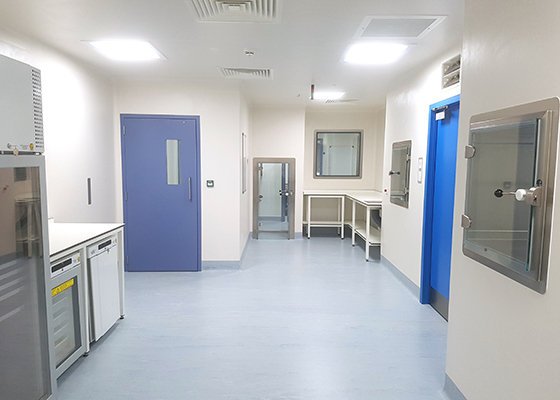 We have installed containment suites for the Health Protection Agency at their Colindale and Porton Down sites, the National Institute for Biological Standards and Control (NIBSC) in South Mimms and Southmead Hospital in Bristol. Our tried and test design philosophies ensure that we routinely meet the stringent requirements set out in the Advisory Committee on Dangerous Pathogens (ACDP) guidelines. 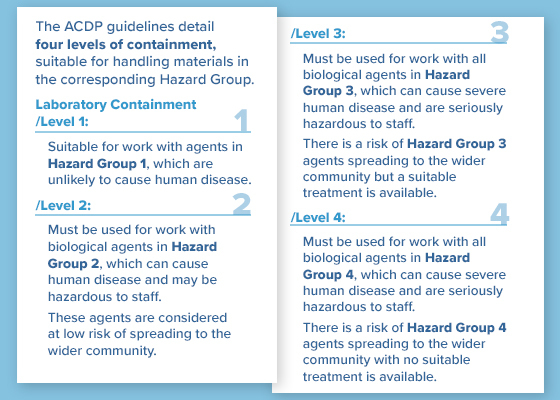 The ACDP guidelines detail four levels of containment, suitable for handling materials in the corresponding Hazard Group.